When I first landed in the United States (Boston in particular), the first thing I did was book a ticket for a Celtics game. I chose to see a Knicks – Celtics game due to their historic rivalry. The TD Garden had a perfect atmosphere and, although neither team was at its best, it was an unforgettable experience. Today, two years later, I’ve been given the opportunity to see the NBA from the inside. As part of the NBA press media representing a Spanish radio station, I am lucky to see the NBA from another point of view; one much closer than I ever expected. How did this amazing opportunity come about? I have connections with media outlets back home in Spain, and I thought that they might need someone that they know and trust who could cover NBA games in the Pacific Northwest. 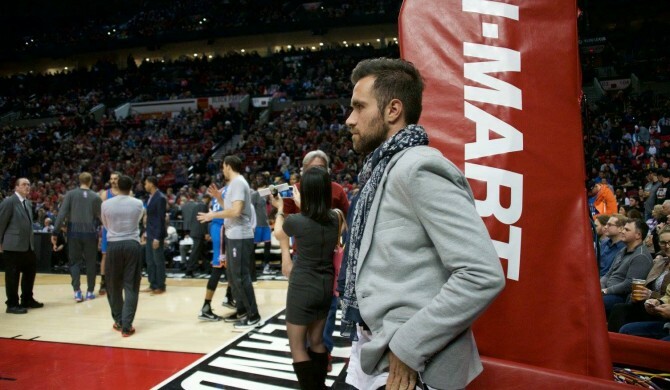 I sent a few emails and in a few weeks was at the Moda Center with my first NBA press credential happier than ever. Lesson: Create your own job and your own chances through networking. The right connections are key in the sports business industry. I usually arrive at the Moda Center an hour and a half before the games. The media entrance is the same one as the entrance to the floor so we have to pass through security. They check my backpack, and I have to go through the metal detector to verify that I am not carrying anything dangerous. After that, I can pick up my accreditation and am all set to start working. Since I am not a full time journalist, but an MBA student who lives in Eugene, I have to ask for credentials for each game. I email the radio station a few days before, letting them know that I will attend the game and they let me pick up my credentials upon arrival. Once I have collected my press credentials, I enter the media room where I enjoy the delicious dinner that the Blazers’ staff politely offers to all the accredited journalists for the game. This is my chance to talk to fellow journalists and do some networking which always helps. An hour before the game, I have the option to interview the coaches of both teams and go on the floor to take photos. As a member of the press, I have access to the VIP area, the bench, and the court. After the game, media members also have access to the locker room. My working station is in Section 207 of the Moda Center, just behind the VIP area. I can see the game perfectly and have a table for my laptop and a TV where I can watch other NBA games or check the game statistics. We definitely have everything we need there. At the end of each quarter, a representative of the Blazers gives us a sheet with game stats and fun facts that help us tweet or write to fans with data to support our comments. I admit that most of us spend the game tweeting. At the end of the game, the Blazers PR department emails or posts on the media website a press release with the game report that we can use to write our articles. Once the game ends, I can attend the Blazers coach press conference or interview the rival coach in the hallway of the entrance to the locker room. After the coach answers our questions we are granted access to the locker rooms to interview the players. How many times have we seen in the media that a player had a triple-double in the game? Or beat the record of 3 pointers in a quarter? If you were a coach, would you give a player that has 18 points and 9 rebounds a chance to play a few more minutes to get his double-double even if you were winning by 20 points? In this game, the statistics have a tremendous influence on the game. Let me share with you an interesting anecdote: Why do you think Draymond Green, aka “Mr. Triple-double,” played just one minute in the 4th quarter of the Warriors – Blazers game? They were winning by 15 points and as one of the players with the most overall season minutes, Green needed the rest. But at that point in the game, Green had 11 points, 12 rebounds and 9 assists. Could you guess what happened after that minute? Good old Draymond got the assist needed for his umpteenth triple-double of the season and went straight to the bench. That’s another advantage of watching NBA from behind the cameras: Continued access to statistics and fun facts provided by the excellent public relations department of the Blazers. This makes a journalist’s life much easier–not only to objectively discuss the game (If you see the “Splash Brothers scoring 60 points with more than 50% FG” no doubt that you can objectively say they have destroyed the Blazers) but it also helps to understand some coaching decisions that a viewer, focused on the game and its continuous highlights, simply cannot see. 3. The food at the Rose Garden / Moda Center– simply delicious! Jose Campos is an experienced Sports Marketer born in Spain and 2017 Warsaw Sports Marketing Center MBA. After a few years working in the UK, Jose came to the US to work at the East Coast before arriving at the UO. After graduating he is looking to work as Sports Agent. Recently launched by Lundquist College Career Services, the International Student Career Empowerment (ISCE) initiative provides international prebusiness majors with a structured approach to gaining practical work experience and expanding their professional networks. The Career Readiness for International Students event was a one-day intensive workshop put on by ISCE that taught students everything from writing effective resumes and cover letters to networking strategies. Business alumni also virtually visited the current students to share their own experience with transitioning from being an international student at the UO to working for an American company. What was your favorite part about the Career Readiness event? What was the most useful thing you learned during the Career Readiness event? How to construct my resume based on the companies I like and am applying for instead of submitting the resumes randomly to job openings. What were you most surprised to learn? I am surprised by how competitive it is to get a H-1B Working Visa nowadays. 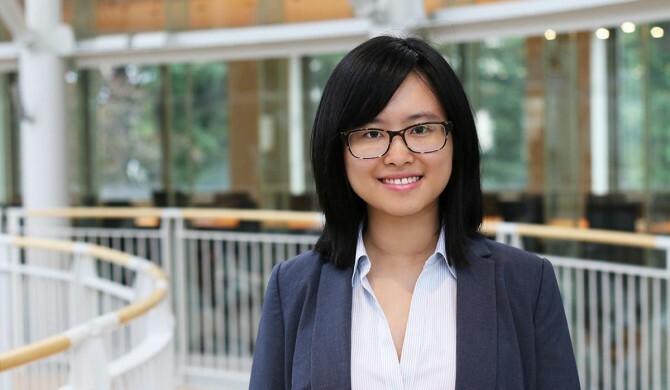 Campus Involvement: President UO Table Tennis Club, member Warsaw Sports Business Club, resource consultant in Mills International Center, works in Undergraduate Advising Office for Lundquist College of Business. Recently launched by Lundquist College Career Services, the International Student Career Empowerment (ISCE) initiative provides international prebusiness majors with a structured approach to gaining practical work experience and expanding their professional networks. Below, Fang Zhou shares her experience from ISCE’s recent Career Readiness event. What was your favorite part about the ISCE? My favorite parts about ISCE were the timeline requirements and the one-on-one consultation. Timeline requirements were great, I didn’t know what I could do initially. Having those deadlines urged me and directed me to take action in personal career exploration. With continuous participation, I gradually felt how it influenced my life positively. I began to enjoy and actively participate in activities, events, and clubs. One-on-one consultation with ISCE director Xiaoying (Ava) Chen was also very helpful. I really appreciated her advising and help. As an international student who started exploring careers in my junior year, there was a lot I had to make up for. I didn’t know how to articulate my past experience on my resume, how to get ready for an interview, or what I should do to better prepare for my future. Through the conservations with the Xiaoying, I felt encouraged to solve the problems I met and keep exploring my career options. When I have difficulties, there is always someone to help me. I’m grateful for the support. What was the most useful thing you learned from the ISCE? The most useful thing I learned from ISCE was the idea that the more you try, experience, and participate in, the more you will gain. There are a lot of good resources and opportunities available on campus and there are many friendly people willing to help us. If I didn’t try or take the initiative, I never would have known how great it could be. I was most surprised to learn how many resources are available in our university from ISCE. For example, just in the Career Center, students can make appointments with an advisor to have one-on-one consultations, sign up for workshops and career events, get practice interviews, or pick up a resume or cover letter writing guide. For the business school, there are even major specific guides and international student specific guides available. What would you tell a friend who is considering joining ISCE? If you are an international student who wants to look for career options in United States and you don’t know how to do it, but you have initiative to do it well, don’t miss the opportunity. ISCE is like a good friend who will help you and motivate you to make progress. Recently launched by Lundquist College Career Services, the International Student Career Empowerment (ISCE) initiative provides international prebusiness majors with a structured approach to gaining practical work experience and expanding their professional networks. 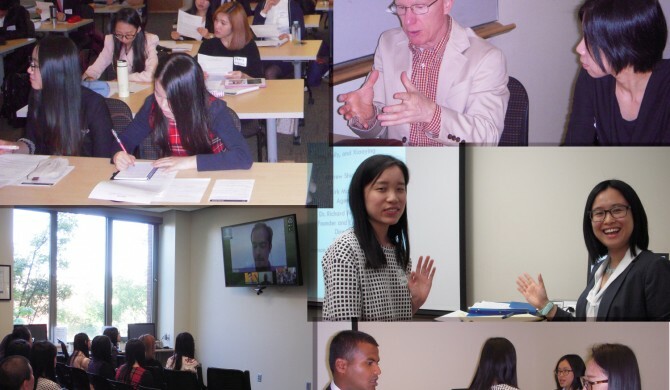 The Career Readiness for International Students event was a one-day intensive workshop put on by the ISCE that taught students everything from writing effective resumes and cover letters to networking strategies. Business alumni also virtually visited the current students to share their own experience with transitioning from being an international student at the UO to working for a company in the United States. Below, Yusuke Ohno shares her experience from the Career Readiness event. My favorite part was the online discussion with former international students from UO who currently work in the United States. They gave us some tips on getting a job in the United States after graduation. The most useful thing I learned was how I should spend my time in college. In the virtual discussion panel, past international students gave us advice that on what American employers want to see in international students. They talked about how we “fit,” meaning we must learn and adopt the U.S. business style. Studying hard is not enough to get a job in the United States. International students have to prove to companies that they can do the same work as local students. Generally, international students focus only on studying, but if I want to get job in the United States, studying and getting a high GPA is not enough. Employers want to see international students get outside of the classroom, join clubs, participate in different kinds of student organizations, and learn about the U.S. culture. I was surprised to learn how important having a mentor is if you want to get a job in the United States. I didn’t realize that I should have a mentor. But I learned mentors have business connections within the industry that students are interested in and can open up career opportunities. Xiaoying Chen ’14 hails from Guangzhou, China. On the day she departed for Eugene and said goodbye to her parents at the airport, she realized she was going to be on a unique journey. One where she would not only learn how to embrace huge lifestyle changes, but one in which she would also discover who she would become in a new culture. What does your job with Lundquist Career Services entail? I serve as an International Career Advisor with Lundquist Career Services. As the international student population with the Lundquist College of Business has been largely increasing, I am providing career advising and programming for international undergraduate students as well as facilitating workshops. I am also the director of the International Student Career Empowerment (ISCE) initiative, which is dedicated to help pre-business international students with their early career development. I actually found this position through Jane Evarian, director of Lundquist College Career Services. I talked to Jane about my passion for student career development and my work experiences in the field. I also had some awesome supervisors in the past who could and were willing to speak of my work ethic and ability. Jane and her team know how much I have invested into career education, so they selected me to head up this new unit. Can you talk a bit about your Lundquist experience? How and why did you decide to pursue a degree in business? I used to work at the Lundquist Career Services as a Career Ambassador for two years when I was an undergraduate. It was a wonderful work experience for me as the work culture has been very inclusive and nurturing. I was able to develop my customer service and interpersonal skills and observe or sometimes even engage in some career development “behind-the-scenes” strategy sessions. I was also a club leader with the UO Human Resources Association, a student-run organization with the Lundquist College of Business. This experience was very important for my leadership development because it helped me learn about, not just the HR culture in the U.S., but also the ways I could also work with domestic students in a leadership team. Do you have advice for international students about to embark on their job searches? My first and biggest piece of advice I can give for international students is to start your career preparation sooner in your college years! If you want to gain a competitive edge in today’s job market, do your homework ahead of time. You can start to develop transferable skills and build up your resume by being actively engaged in student club activities or via on campus student employment. Talk to a career advisor and learn about how to make your job search efficient. The Resource Library in DuckConnect can also be a very helpful research resource. Job seeking is essentially about relationship management. We have job search and networking workshops designed specifically for international students throughout the year. By conducting informational interviews with alumni and potential employers, you will expanding your network, obtain practical advice and increase your chance of success. If students want to talk with you about your experiences and make an appointment how can they contact you? If students are enrolled at Lundquist, they can make an appointment with me through DuckConnect. Or feel free to contact me via email at xiaoying@uoregon.edu. Is there anything else you would like readers to know about your new position with Career Services or what international students can do to make their time at the UO/Lundquist a good experience? As an international student in the U.S., gaining practical experience and expanding our professional networks are the keys to enhancing your future career and employability skills, no matter if you choose to go back home or stay in the U.S. after you graduate. So do not just sit in a classroom and listen, go out and be engaged on campus! Find out what you like or what you are good at by being an active club member or leader or a dedicated student worker or volunteer.